ISTANBUL, Turkey, Mar 14 2016 (IPS) - On the evening of March 4, heavily armed police forced their way into the headquarters of the Turkish daily Zaman. The hundreds of protesters that had gathered in front of the building in an Istanbul suburb in solidarity with their newspaper were violently dispersed. The takeover of the Feza media group – consisting of Zaman, the English-language Daily Zaman and Cihan news agency – was ordered by a local Istanbul court, and according to the Turkish Prime Minister Ahmet Davutoğlu this decision wasn’t in the slightest politically motivated. “This is an entirely legal process. No one should have any doubts regarding press freedom in Turkey,” the Prime Minister claimed in a televised live interview on Sunday. In spite of Davutoğlu’s claims to the contrary, few observers nourish any doubts that the takeover of Zaman was a political manoeuvre by the ruling AKP, with the intention to silence one of the most vocal and influential newspapers in the country. 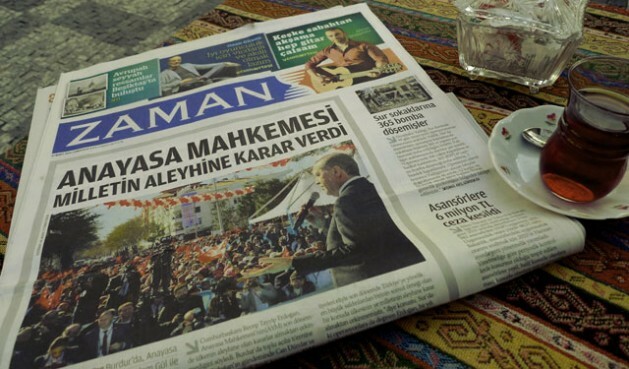 With a circulation of about 650,000, Zaman was Turkey’s biggest newspaper. This, in combination with the newspaper’s close ties with the Gülen movement – a former close ally and current enemy of the AKP – made it a potential threat to the government. The government takeover of Turkey’s largest newspaper comes at a critical time. A violent conflict that has already cost hundreds of civilian lives rages on in the country’s east. Millions of refugees from the war in neighboring Syria have crossed the border into Turkey – many of them waiting for an opportunity to move on to Europe, whether legally or illegally. Mustafa Edib Yilmaz, the foreign editor of Zaman, sees three possible reasons why the AKP-led government decided to take action now: internal disputes within the party, the international community’s reliance on Turkey in stemming the flow of refugees into Europe and the fight against the so-called Islamic State, and the possibility of an upcoming referendum on the shift to a presidential system. The AKP under the leadership of President Recep Tayyip Erdoğan stands at a crossroads and is seeking to consolidate power. Faced with opposition against his increasingly authoritarian rule of both his party and the country as a whole, Erdoğan has resorted to ever more extreme measures to safeguard his position at the helm. “If you have been clinging on to power for so long, uncontested, unchallenged, you might be too much obsessed – maybe – with the power you have so you cannot tolerate losing it,” suggests Yilmaz. Dani Rodrik, a Turkish economist and Ford Foundation Professor of International Political Economy at Harvard University thinks Erdoğan cares very little about a possible international backlash against the AKP’s rule as a result of its controversial politics. The takeover of the Feza media group is just the latest in a series of crackdowns on press freedom in Turkey, which currently ranks 149 out of 180 countries in the World Press Freedom Index. Just one week before the police raid of the Zaman offices, the satellite broadcast of the Istanbul-based IMC TV was pulled off the air at the request of an Ankara prosecutor on allegations of “making terrorist propaganda”. IMC TV was known for its extensive coverage of the conflict in the east. On January 20, the channel acquired international fame when the army shot one of its cameraman, Refik Tekin, in the leg while he was filming in the besieged town of Cizre. The channel was blacked-out in the middle of a live interview with Can Dündar and Erdem Gül, two editors of the Turkish daily Cumhuriyet who had just been released after spending 92 days in pre-trial detention. Dündar and Gül had been released after the country’s Constitutional Court ruled their imprisonment illegal. The two journalists still face trial and could potentially be sentenced to life in prison for exposing the Turkish government’s covert arms shipments to Syrian rebels. He foresees that the newspaper will go bankrupt and will eventually have to be shut down, just like the Bugün and Millet newspapers that were both taken over in a similar fashion and turned into government mouthpieces in October last year.